In this blog post, I assume you already have an Azure subscription and a user account set up. If you do not, check out Windows Azure Training Series: Understanding Subscriptions and Users. You might also like to read Windows Azure Training Series: Understanding Azure Storage for an overview of Azure storage. To use Azure storage, you need to create a storage account. To do this, first go to the Windows Azure Platform Manage Portal and log in. Then, click on the New Storage Account button at the top left corner of the portal as shown below. You will be prompted to enter a unique URL (or account name) for this storage account. Azure storage is always accessed using a URL based on this name, plus the type of storage you’re accessing, plus the “core.windows.net” domain. So, using the name shown below, accessing blob storage would be done using the URL, http://myuniqueaccountname.blob.core.windows.net/. To access table storage you would use the URL, http://myuniqueaccountname.table.core.windows.net/. After entering your URL, choose a region where your storage account will be located and then click create. After the account is created you can view its properties in the Properties grid on the right side of the management portal. The most important property is the primary access key. To access it, click on the View button. The window shown below will open; it allows you to view and copy the access keys to the clipboard. You will need to add the access key to the configuration file of your Azure application. In Visual Studio, open the ServiceDefinition.csdef file in your Azure service project, and add the configuration setting shown below. Also, open the ServiceConfiguration.cscfg file, and set the value of that setting as shown below. Of course, you’ll use your own account name and account key. Finally, you’ll need to add the following code to your WebRole.cs file. Tune in next time and we’ll take a look at the code required to write to blob storage. There are a couple common ways of storing data when using Microsoft Windows Azure. One is SQL Azure, which is a cloud-based version of Microsoft SQL Server. The other is Azure storage. SQL Azure will be familiar to those who already understand relational databases. It may also make moving an application to cloud easier, if that application already uses SQL Server. Azure storage has some advantages as well. First it is inexpensive. Azure storage costs about 15 cents per gigabytes per month, compared to $10 per gigabyte per month for SQL Azure. It can also be very large. Depending on your instance size, it can be up to 2 terabytes. It is also cross-platform, and accessed using standard internet requests. There are four types of Azure storage: blob storage, table storage, queue storage and Azure drives. Blob storage is used to store binary data. This could be pictures, videos, or any other binary data. Table storage is used to store structured data. It is similar to a database, but not relational. Table storage is a convenient way of saving business entities in an object-oriented program. In many ways it is simpler than relational storage. Queue storage provides a simple messaging system that allows different Azure roles to communicate. For example, a user may request a report to be run using an application running in a Web role. That request could be sent to an Azure queue. Later a worker role can process the request, and then email the completed report to the user. Azure drives allow storage to be access using standard NTFS APIs. This could be particularly useful if you have an application that already writes to a hard disk and you want to migrate it to the cloud. If you’re using .NET though, accessing storage is made easier using the Azure SDK. If you don’t already have it, go to this link, http://www.microsoft.com/windowsazure/windowsazure/, and then click on the “Get tools and SDK” button. 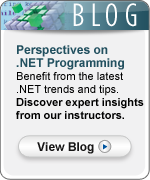 You might also like to read this article, Windows Azure Training Series – Setting up a Development Environment for Free. Once you have the SDK installed, set a reference to Microsoft.WindowsAzure.StorageClient.dll, and you’re ready to go. In later posts, we’ll take a look at some code to write to Azure storage. In the meantime, you might like to read the prior posts in this series. You might also like to come to Learning Tree course 2602, Windows Azure Platform Introduction: Programming Cloud-Based Applications. Software applications often need to store data and applications written for Windows Azure are no exception. Windows Azure provides three types of storage: queues, blobs and tables. As we have already seen something about queues in a prior post we now turn our attention to blobs and tables. Part 1 will cover blobs and Part 2 will cover tables. Note: SQL Azure (part of the Azure Platform) provides relational database capability. SQL Azure will be discussed in a later post. Azure storage is based on REST. All storage objects are available through standard HTTP calls to a named URI. In practice, for .NET developers, though, it is probably easiest to just use the StorageClient assembly included as of version 1.1 of the Azure SDK. It is worthwhile mentioning that all objects stored in Windows Azure are fault-tolerant. Behind the scenes everything is replicated three times. If a corruption is detected Azure can transparently fail-over to a replicated copy. In addition Azure makes a backup copy of our data in a separate data center. That way even if there is a catastrophic event which takes out the main data center our data remains intact. Having these automatic backups is an example of how Azure frees the developer from certain administration and operational details. Blobs are the simplest type of data storage. Essentially a blob is just a sequence of bytes; it can be anything the application needs it to be. It can be a photo of your mother-in-law, a word processing document, a zip archive containing the entire contents of your Megadeth music library … anything. It is sometimes believed that the term BLOB is an acronym for Binary Large Object although some disagree with that. In any case the word originally came from database terminology. An Azure blob is similar to, but slightly different from that usage. An Azure blob can have metadata associated with it. Metadata is often useful in providing information about the data (such as the name of the person in a photo) and for searching. Azure blobs must exist in “containers”. Containers can hold one or more blobs but a container is not necessarily a database. It is useful to think about containers and blobs using the familiar (to most!) folder and file metaphor. A container is like a folder; a blob is like a file. Containers can also have associated metadata. So, briefly, how might some of this look in code? If we use Visual Studio to create a Cloud Service project, much of the work (setting up the references, etc.) is taken care of for us. Then we can begin creating containers and blobs in our application. As a very simplified, minimalistic example we could create a container and then create a blob in that container. In this example our blob is nothing more than a hard-coded array of bytes but, as mentioned, it could be any kind of binary data we can access in our code. In Learning Tree’s Windows Azure Course we will have hands-on exercises where you get to work with blobs in a much more realistic scenario. This simple introduction was only intended to show the bare essentials of working with Azure blobs!